Can an all-solid-state guitar amp really use DSP to create a convincing tube-like sound and feel? I know it sounds like heresy, but I've rarely found a valve guitar amp that I really like! That's because, other than a select few low-power models, you always seem to have to play them too loudly before you find their sweet spot. For most studio work, and for the sort of small pub gigs that I often play, that's just no good to me — even before you consider how the performance of their tubes will change over time, and the cost of replacing them. Instead, in recent years, I've been using 'hybrid' amps, both live and in the studio. Although these often have a tube stage, they also include some form of digital modelling, plus on-board effects. So, when I heard that UK amp manufacturers Blackstar, who are best-known for their valve amps, had come up with a new twist on DSP-driven tone-shaping, I was intrigued. Their ID range is actually completely tubeless, and I'd thus originally planned for this review to be relatively brief — but I found that these amps get so much closer to true valve performance than anything else I've tried that I thought I should investigate it in a little more detail. There are a few different models in the range (see the 'ID Parade' box), but I'll focus mainly on the ID:30 I had for testing. The ID:30 TVP's front panel plays host to the audio I/O and controls. Using a computer, via the USB socket, you have access to more controls than actually appear on the front panel, and are able to store your new patches for use on the road. The TVP control allows the user to select from a range of different output stage valve models. Every company has their own slant on amp modelling. Vox, for example, whose amps I've used a lot over the years, have their Valvetronix tube stage. But while the ID:30 TVP may seem similar in concept to existing digital amps, there's a lot of innovative stuff going on behind that friendly front panel, not least something Blackstar call 'True Valve Power' (TVP), which was developed here in the UK by designer Bruce Keir and his team. TVP offers six distinctly different power-stage responses, courtesy of a SHARC DSP chip. These are based on the performance of EL84, 6V6, EL34, KT66, 6L6 and KT88 valves used in a push/pull configuration. Not only does TVP emulate the valves' non-linear characteristics, the effects of power-supply sag and differences in headroom, but it also replicates the very important interaction between speaker and output transformer, which changes the playing feel and headroom of the amp as you dial in different valve types, and generates an SPL comparable with that of a real valve amp of the same power rating. Although all the amps in this series run essentially the same software, each has a bespoke set of voicing coefficients. These are tuned to compliment the acoustic character of its speaker cabinet, for a more consistent family sound across the range. The operating system is stored in flash memory, and can be updated via the free Insider software (of which more later). We rarely give it a thought in the context of digital amplifiers, but DSP engines generally don't like being switched off: they much prefer to be shut down in an orderly way, and in these amps there's enough energy stored in the power-supply capacitors to execute a graceful shutdown if you simply pull the plug. One reason why valve amps tend to sound louder than their solid-state counterparts concerns how the output transformer relates to the speaker's reactive load, which varies with frequency and is responsible for the low-end 'weight' that's often associated with valve amps. When near resonance, the speaker impedance increases, and valve amps typically have a lower damping factor than solid-state amplifiers. This 'looser' degree of control around resonance contributes to a valve amp's punchy sound and responsive feel. These complex characteristics are all recreated in the TVP section before the audio hits what is essentially a clean, solid-state output stage, so that each valve type retains its own voicing character at all master volume levels. While the various valve types are emulated in great detail, produce clearly audible differences and incorporate a degree of power-supply sag, there's no option to experiment with Class A or Class A/B output configurations. This, though, doesn't seem to restrict the available range of sounds unduly. If you need more asymmetrical (Class A) distortion, you can push the preamp harder and the power amp less so. You can also bypass the TVP section when it's not required, but the amp sounds much more valve-like with it switched in (perhaps the bypass feature is provided just to show you how good that section sounds!). 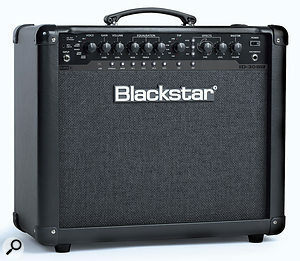 Rather than bombard you with a load of different emulations based on well-known amps, Blackstar provide just six preamp voicings, which range from clean to utter filth: they're designated Clean Warm, Clean Bright, Crunch, Super Crunch, OD 1 and OD 2. These seem to be based on the voicings of their own valve amps, and in an A/B test using the same speaker cabinet, you'd be very hard pushed to tell valve from DSP. I found Bright Clean, Crunch and Super Crunch to be particularly versatile, because by using your guitar's volume control you're able to go from virtually clean to classic rock and blues. The OD settings can also be coaxed into classic rock, if metal isn't your thing, and even they clean up significantly as you wind back the guitar volume control. The 24-bit input stage copes with the hottest pickups and booster pedals without running out of headroom, and such background noise as is audible sounds essentially the same as you'd get from a valve amp — and definitely not the digital hash you might have anticipated. The tone controls in this range are modelled on a traditional tone-stack circuit, comprising bass, mid and treble. On the ID:30 TVP there's no physical mid-range control, although you can still adjust the mid-range EQ using the supplied Insider software. A three-band EQ might not sound all that flexible, but in this case it is! The clever part is that Blackstar's ISF control, which is also used on their valve amps, essentially morphs the tone stack component values from US to UK style, and can give you anything in between. Apparently, the tone stack design used on the majority of valve amps is very similar on both sides of the Atlantic, and the sonic differences are down mainly to the selection of component values in the filter circuits — so although there are no specific amps modelled, you can get pretty close to the sound of just about anything by juggling the ISF control and valve type. I initially thought that I'd miss having an adjustable presence control, but in the event the amp seemed to deliver everything I asked of it without one. 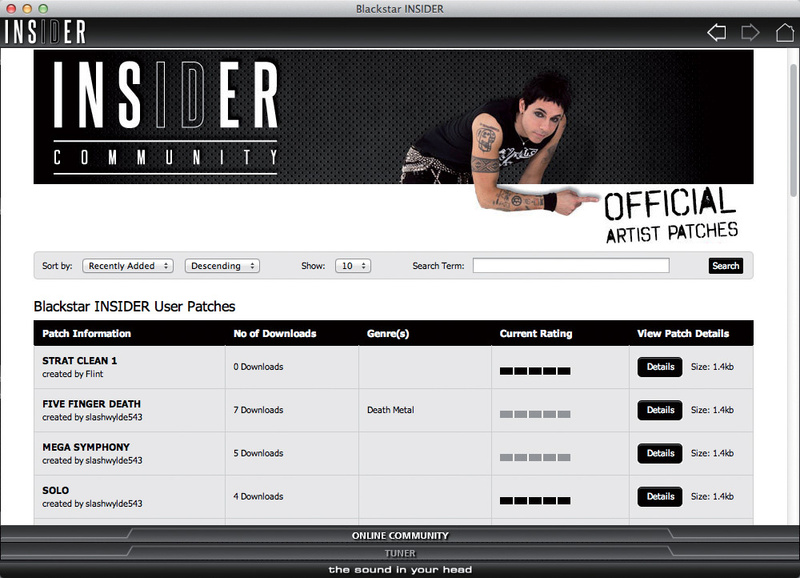 The Insider software, which must be downloaded from Blackstar's web site, runs on Mac and Windows computers, and connects to the amp via the included mini-USB cable. It provides a graphical editing environment in which the effects show up as pedals, and offers a means to save your own library of custom patches, as well as the option to swap patches with other users when your computer is connected to the Internet. 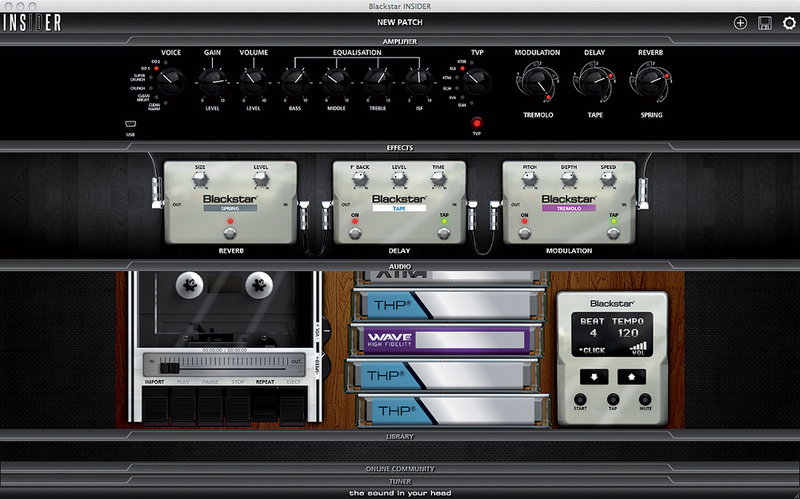 The software also allows you to set up the internal noise gate to clean up heavily overdriven sounds, and to configure the USB port, either for recording directly to a computer DAW or for taking a clean guitar recording and re-amping it. Note that currently only a 48kHz sample rate is supported, but this is not usually a problem in practice. The effects can be edited in a little more depth with the software than on the amp itself, and you gain access to that missing mid-range control. As yet, there are no Resonance and Presence controls accessible via the software, although I wouldn't be surprised to see these introduced during a future upgrade. For recording, you can either opt for a speaker-emulated amp sound (the DSP emulation algorithm is based on Blackstar's Series One analogue speaker emulator) with the modulation and reverb effects in stereo, or choose dual mono, where one channel is clean DI'd guitar and the other is the amp sound in mono, again with speaker emulation. There's currently no option to record the amp without speaker emulation, which is something I'd like to be able to do on occasion, just so that I can audition different plug-in cabinet emulations. As the amp's firmware can be updated from the Insider software, I wouldn't rule this out for the future, and discussions with the software engineers suggest that this feature is 'on the list'. Other software facilities include a built-in audio player, so that you can play along to MP3s, and a 'phrase trainer' that lets you loop and slow down pieces you're trying to learn, while maintaining the original pitch. If you choose the amp as the replay device for your DAW, the live guitar can be heard mixed with the DAW output via the headphone jack, so you can record your guitar with no distracting latency. The headphone output level is independent of the master volume control, so you can decide whether or not to hear the sound from the amp's own speaker as you record. Another important aspect of the software is that it allows you to save a huge library of patches, which you can then move into the memory slots within the amp. Although only 12 patches can be accessed from the front panel, the amp has the capability to store 128 patches, which can be accessed via the optional FS10 footswitch. 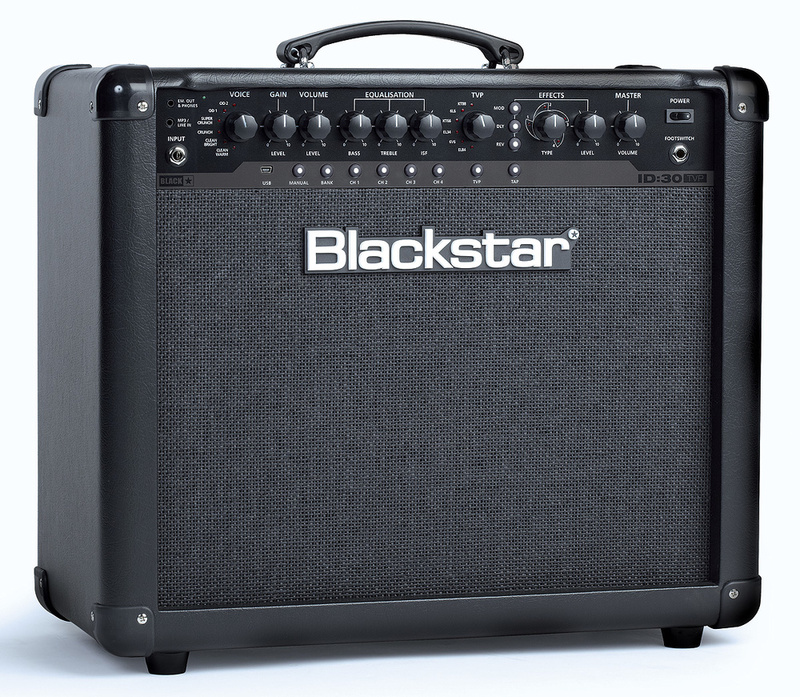 Blackstar's Insider software provides an intuitive means of controlling any ID-series amp, and it offers control over parameters that aren't accessible on the amp, including the ID:30 TVP's 'missing' mid-range EQ control. The six TVP valve-type emulations are selected via a six-way rotary switch, which is accompanied by a TVP On/ bypass button beneath. Good use is made of multi-coloured, illuminated buttons and red status LEDs to indicate control status. In common with many digital amps, the controls need to be moved through the physical position of their current setting before they start to affect the parameter value — that is, unless you push the button to put the amp into manual mode. Usefully, a recall indicator LED flashes twice as a knob 'passes through' the stored value. The master volume control then sets the overall amp level, which is not programmable. Up to three effects may be used at the same time: modulation, delay and reverb. There are four variations on each, and a tap-tempo/rate button sets repeat times and LFO rates. Overall, the effects sound rather good, especially the spring reverb, tape delay, phaser and chorus, and tremolo and flanger are also available in the modulation section. Reverbs are offered in Room, Hall, Spring and Plate types, while delays are divided into Straight Digital, Analogue, Tape and Multi-tap. A single control, divided into four segments, is used both to select the effect variation and to adjust one parameter of the effect type that's selected, such as reverb decay time or delay feedback. An adjacent Level control adjusts the mix or intensity of added effect. A Tap button dictates the tempo to which effects are sync'ed. Tempo may also be adjusted via the FX Level knob, by holding down the Tap button simultaneously. Three bi-colour illuminated buttons are used both to select an effect for editing and to turn effects on and off. In Tuner mode, they also double as the tuner display. One clever marketing feature is that the amp ships in demo mode, which means that no matter what nasty sounds customers may create in the store, the factory patches are reloaded next time the amp is switched on. Once you exit this mode, you can create your own patches, either by starting from scratch in manual mode or by editing one of the factory patches. With the TVP function turned off, the sound is still pretty satisfying, but you can tell from the feel and lack of grunt that you're not playing a valve amp. Turn it on and everything changes, whether you select the EL84 for its jangle, the EL34 for its smokey British sound or the KT88 for its massive headroom. It takes a while to experiment with the interaction between the preamp and TVP settings, as this is the key to the tonal versatility of the amp, but persistence soon pays off. As the output stage is pushed harder, the different tonalities and the amount of headroom become more obvious, with the EL84 having the least headroom before saturation. Another thing I noticed right away was that there was no aliasing when playing up at the 'dusty' end (ie. high up the fretboard) with overdrive engaged. This is an issue I've noticed to some degree on most other digital amps. I asked the designers whether they used up-sampling to get around this, and although they didn't tell me exactly what sample rate was used, they did confirm that the audio was up-sampled to over four times the input sample rate. Every TVP setting makes the amp feel and sound different, with varying degrees of 'real amp' intermodulation distortion when driven hard but, unlike a valve amp, you can get that 'pushed' output stage sound — complete with a sensation of power-stage compression and low-end thump — at any level, from bedroom-friendly to live gig. It took me no time at all to set up suitable recreations of my standard live set sounds, and they all felt right, with great touch responsiveness. What's more, the amp didn't blur the distinction between single-coil pickups and humbuckers; my Strat still sounded like a Strat, and my SG like an SG. It probably helps that this amp has a 12-inch speaker, whereas many low-power modelling amps have a speaker that's 10 inches or smaller. One observation I'd make, though, is that it can be tricky to match the levels of different channel patches, especially very clean ones against those that have a high Volume setting, to push the virtual valves harder. By careful selection of the output valve type this can, in the main, be worked around, but I hope it will be possible for Blackstar's designers to add a 'post-valve' patch level control in the Insider editing software. When using a lot of Bass EQ, this amp seemed to have a noticeable resonant 'cabinet thump' centred around bottom C on the guitar, although this was less evident at more sensible EQ settings, and even less so with the amp mounted on a stand rather than placed directly on the floor. Not having a physical mid-range control was a little frustrating, and if panel space makes it impossible to fit one, I'd have settled for using one of the other knobs in conjunction with holding a button down, 'shift style'. The same goes for presence and resonance. In my studio tests, I found the ability to scale volume without compromising tone a big plus, and the same goes for the good-sounding speaker emulation. The USB audio link was also excellent: it made DI'ing and re-amping easy, and worked fine on my Mac Pro running Snow Leopard, although I'd have appreciated a 44.1kHz sample-rate option, as that's my default DAW project sample rate if a CD is to be the end product. The software threw the occasional wobbly when jumping between the community patch area and the main editing screen, but this is apparently due to the latest update of Microsoft's Silverlight, which is required to make the whole thing work. Blackstar's software team are talking to Microsoft and looking for a solution, but even 'as is', it's perfectly usable, with just the odd unexpected quit or freeze. Currently, the USB connection needs no driver, but Blackstar are planning to release one to get around occasional sync issues that occur with a small number of computers (my Macbook Pro running Lion being one of them!). To my ears, the ID:30 TVP gets extremely close to the experience of playing through a good valve amp, with a great sense of headroom and touch sensitivity. However, you retain full control over its volume, and when you open it up even this 30W model gets very loud indeed. Although it doesn't purport to emulate specific 'classic' amplifiers, you can get very close to the sound of all the usual suspects, from a tight, Fender-like tone to a throaty UK stack or a Vox-like chime. This amp really is incredibly versatile and rewards experimentation. Blackstar's take on the digital amp is certainly very different from what their competitors offer, and being able to update the amp software via USB adds a new dimension to the product, as it allows it to be kept up to date in much the same way as traditional music software. What's more, it was hinted by Blackstar that additional effects may be added to the various sections at some future date, which draws a parallel with software plug-ins. Being able to use one of these amps as a silent recording device also guarantees it a good reception in the home studio, where the inclusion of stereo effects will also be valuable. Blackstar's development has certainly paid off, and in my view they've raised the bar in terms of what we should expect from an all-digital amp emulation. There still remains a certain snobbishness when it comes to digital amps, but I invite you to do a blind test against a 'real' valve amp, because Blackstar's TVP technology might just win you over. Cost is also in the ID:30 TVP's favour, as you can buy the whole amp for little more than the price of a decent set of replacement valves for an all-valve equivalent! Blackstar's three-year warranty is a nice bonus too, and speaks volumes about their confidence in the quality of their manufacturing. The main contenders in the modelling amp arena are Line 6 and Vox, with Fender having also joined the race. However, there are also many more studio-specific modelling preamps available, as well as a multitude of software-only solutions, if you don't need a traditional amp format. The ID:30 TVP, reviewed here, is just one of the new ID range of combos and heads. Its 1x12 closed-back cabinet features Blackstar's usual smart styling and, as it weighs only 13kg and measures 500 x 460 x 250 mm, it's easily portable. There are also 15W and 60W combos, 60W and 100W heads, and a 60+60W stereo combo too, as well as a matching 4x12 cabinet. All the amps are designed in Northampton, UK. They're built in China, but finished to an extremely high standard. Models of 60W and above include a MIDI In port, to allow smooth control over any of the amp and effect parameters, as well as patch switching. Those models also have a variable resonance control, which essentially adjusts the cabinet/speaker resonance as emulated in DSP, and a separate Presence control. MIDI connectivity and the Resonance and Presence controls are missing from the 15W and 30W models, in which the values are fixed. All models have a USB port for use with the Insider editing software and for recording/re-amping applications. The optional FS10 footswitch connects via a quarter-inch TS jack, but if a standard latching footswitch is connected, the amp detects this and uses it to switch back and forth between the first two patches in the current bank. The FS10 includes a numeric patch display and operates in three modes. Patch Mode allows access to all 128 on-board patches via bank switching. There's also a push-and-hold option to activate the tuner. Alternatively, you can use it to switch the effects within a patch, pedalboard-style; the fourth switch is used to control the tap tempo/speed function. Navigation mode accesses all 128 patches stored in the amp, by stepping through them, and allows effects to be preselected so that they can be recalled via a single switch press. When you step to a new patch, the display flashes, indicating that you have to press the switch to load it. This mode is also used when storing patches into the extended patch memory area. Controls emulate those of a traditional valve amp. As loud as a comparable 30 Watt valve amp. Sample rate 48kHz only at present. 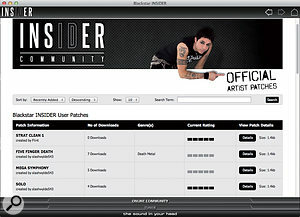 Insider software not entirely stable on some computers. Some controls not front-panel accessible on the 15W and 30W models. This range of amps may look traditional, but behind that seemingly innocuous front panel lies some revolutionary software design that redefines what you should expect from a digital guitar amp. Korg USA +1 631 390 6800.